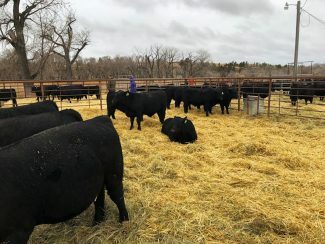 Green Mountain presented some impressive bulls. Buyers kept a close eye on the offering at Paint Rock. Lot 27 at $25,000, GMAR Resource F135, Dob 1-31-2018, Reg 19088589, SAV Resource 1441 x GMAR Alliiance X 143, sold to Mangen Angus, Broadus, Montana. Lot 18 at $13,500, GMAR Resource F003, Dob 1-21-2018, Reg 19088474, SAV Resource 1441 x GMAR Upward A181, sold to Bickle Cattle Company, Ismay, Montana. 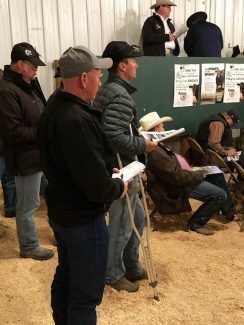 Lot 47 at $13,500, GMAR Cowboy Up F255, Dob 2-15-2018, Reg 19115187, HA Cowboy Up 5405 x GMAR Significant B293, sold to Bauer Land and Livestock, Claremont, Wyoming. Lot 2 at $13,000, GMAR Traction F062, Dob 1-27-2018, Reg 19088527, JMB Traction 292 x ICC Bonview Gammer 3028, sold to Darrel Howard, Dunn Center, North Dakota. Lot 5 at $13,000, GMAR Resource F059, Dob 1-27-2018, Reg 19088524, SAV Resource 1441 x GMAR Industry X324, sold to Coonet Brothers, Harlowton, Montana. Lot 83 at $13,000, GMAR Cowboy Up F208, Dob 2-8-2018, Reg 19088656, HA Cowboy Up 5405 x GMAR Final Product B179, sold to Centennial Livestock, Dillon, Montana.